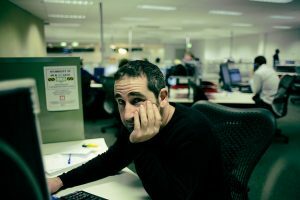 Although offices don’t have a particularly positive reputation, I think we can all agree that we would be a little happier if, the place in which we each spend approximately 19,000 hours during our lifetime, could hold feelings of joy and positivity, rather than cripplingly depressing uniformity. It’s a tricky business going about, trying to “joy” up one’s office, isn’t it? There are multiple things which need to be taken into account. Below are just a few reasons why having a happier environment, and therefore more satisfied employees, will benefit the business, the boss, and the staff. First off, (and I think we can all appreciate the importance of this one) is the fact that when an employee is happy and feels that he or she is a valued, well-treated, and an essential element of the business, said employee respects their boss. When happy employees are in the majority, you will find that an incredible thing happens: instead of bringing a problem to their employer, or griping about it with colleagues, the team comes together to solve the issue! 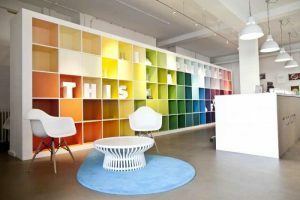 As you can imagine, this is highly valuable, and if a bit of office Feng Shui could do such a thing – who would deny it? For the long-term benefit of the business, you can rely on the following truth. Happy employees are invested in the business: they want it to be successful and will go out of their way to help where they can while doing their job with purpose. Satisfied employees are far more likely to want to remain in their current job. This means they will think long term and put more into the business, and in the long run, they will reap the rewards. A large part of what makes up a perfect office for you may depend on what industry you’re in, the practical side of things, your interests, etc. A large part of it may come down to personal preference. Allow me to take you through a tour of MY perfect office. Starting off, you may or may not have noticed that I’m pretty fond of the colour orange, coupled with black and white. Therefore I would opt for an eye-catching orange wall, and three white walls, containing theme appropriate modern artwork pieces. There’s nothing quite like a bit of good Feng Shui in your office. To create, this I would start off by decluttering. I would declutter my desk, the room, the office supply of clickety pens, the bathroom, the chocolate cupboard (if you know what I mean), Bill’s weird cat pictures. It’s a sacrifice that must be made. In the centre, and toward the back of the office, would be a desk, upon which one might find a “Be the Boss” mug, pictures of loved ones, and a stapler. A desk spacious and sturdy. Preferably enough so to hold a baby elephant. Under the desk, and out of sight, would sit a personal refrigerator for… personal reasons. 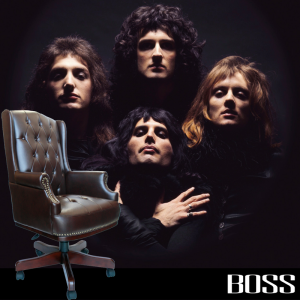 Is this the real life, is this chair fantasy? Additionally and finally, houseplants are proven to have many benefits beyond their evident aesthetic contribution. Their photosynthetic tendencies complement our breathing habit perfectly. They clean the air, deter illness, and (believe it or not) help you to work more effectively! Avoid any plants named Audrey. 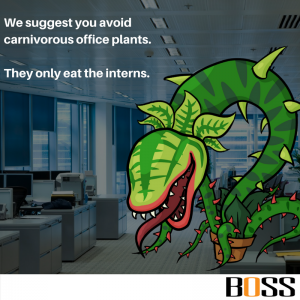 They have a habit of eating the temps and interns. So if you’re sitting in an office that makes you want to pull your hair out every day, I would suggest that you take some time and put in some effort to change things up. Feng Shui your desk, get a painting, bring a pot plant to work, maybe install a personal fridge. Whatever change you need, make it. Did you know, we sell a huge variety of office furniture and can even create a CGI mockup of your perfect office? For a free, no obligation chat/survey give the team a holla on 01756 793003.